Electronics brands have some of the most passionate Fans on social media - but sometimes, that passion comes out in the form of negative comments that turn into negative publicity. Branded posts can get hijacked by damaging comments, and other social media users are likely to notice persistent bad press. It hurts the business's bottom line. We found that the Electronics brands getting the most out of their social media marketing were those that ran transparent News Feeds by opening their Facebook timelines. They invited Facebook users to engage with them, and responded thoughtfully to as many posts as possible. 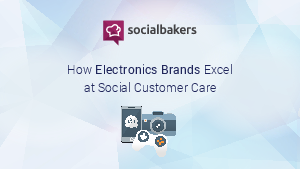 See how you can get value out of social customer care as well by reading our report on best practices for Electronics brands.